Mike Masnick’s Blog » Someone Trying To Send Us A Message? Someone Trying To Send Us A Message? Last week, in talking about pre-wedding stress, a friend of mine said that couples come out of it stronger, noting something along the lines of “the best bonds are formed in the hottest fires.” I didn’t know he meant it so literally. It can’t be a good thing when the site of your upcoming (less than 2 weeks) wedding is engulfed in flames and making headlines half way around the world. 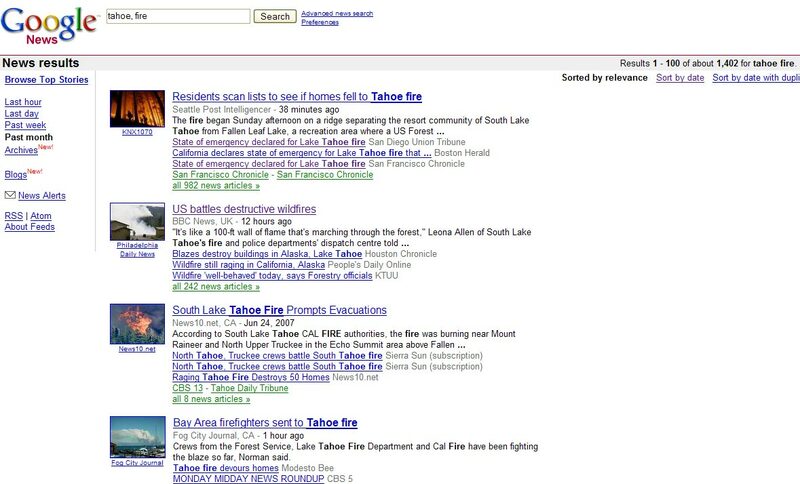 Google News currently shows 1,402 results for “tahoe fire.” Yay. 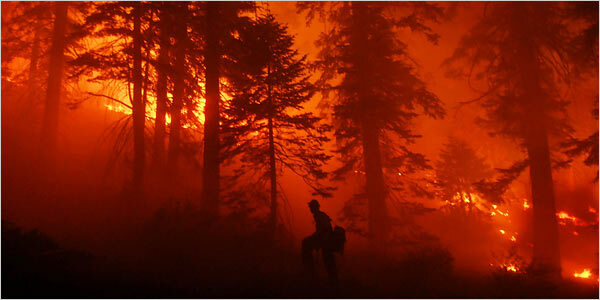 “It’s like a 100-ft wall of flame that’s marching through the forest,” Leona Allen of South Lake Tahoe’s fire and police departments’ dispatch centre told the Los Angeles Times. Lt Kevin House, of the El Dorado County Sherriff’s Department, said it was “far and above the biggest disaster that has happened in this community”. Well, assuming we make it, I imagine everything will smell like a great big BBQ cookout. More seriously, we hope that everyone up there is doing okay. So far, there are (amazingly!) no reported casualties, despite approximately 200 houses being burnt down. Hopefully this thing gets under control quickly and the damage is limited. You were my first thought when I saw the news today… hope it’s safe, and that they get it under control soon. Good luck with everything else!